Okay, I admit it. 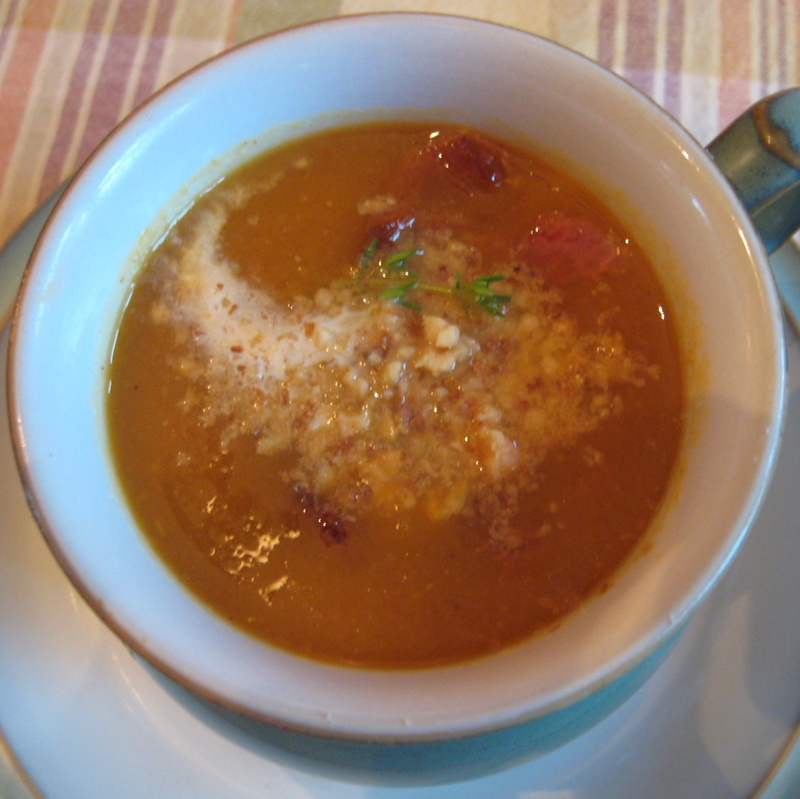 I ate three cups of this soup while I was taking pictures of it! It is the perfect blend of salty, sweet and heat – with chewy bacon and crunchy nuts. A lovely fall indulgence. Garnish each bowl with a dollop of sour cream, a sprinkle of cinnamon, a good bit of toasted walnuts, a little fresh thyme (if you have it), and the reserved chopped bacon. To make the soup, fry the bacon in a heavy bottomed stock pot. Add the stock and water and bring to a boil. Reduce the heat and simmer for about 30 minutes, until vegetables are soft enough to puree. Puree with immersion blender (my favorite method) or strain the stock and puree the vegetables in a food processor (extra dishes for you.) If you use the food processor method, recombine the pureed vegetables and the stock in the stock pot and return it to the stove. Whisk in the pumpkin puree, the spices, the honey and the chipotle. Simmer for 15-20 minutes. Taste for salt, heat and sweet. Add more salt, chipotle or honey, if desired. You can also add about ½ cup of half and half to give it a richer, creamier texture. Garnish with cinnamon, sour cream, bacon and toasted walnuts or toasted pumpkin seeds. I used walnuts because that’s what I had in the cupboard and I added a sprig of fresh thyme because it’s September (at this moment) and the garden is full of herbs! MMMMmmm. So going to indulge myself with this. Thank you for sharing. From One of your Adoring Fans who loves you and thinks you are hilarious.